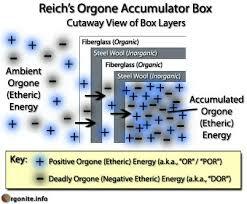 Reich found that organic materials attracted and held orgone energy; and metal attracted and then rapidly repelled it. By designing an enclosure, similar to the Faraday cage, lined on the inside with metal and made with alternating layers of organic and inorganic materials, he discovered that atmospheric orgone energy was accumulated and concentrated inside. He called this device an orgone energy accumulator. Within the box-like enclosure, the orgone energy given off by an inside metal wall is attracted to the opposite metal wall which again repels it. This creates an oscillation of the orgone energy particles inside. when it is concentrated, orgone energy often has a blue-to-violet color. When a person uses an orgone accumulating device, the energy field of the user and the energy field of the device make contact, excite each other, and the two fields luminate, creating an even stronger charge. Since a human being has the higher energy charge, the user attracts and absorbs the energy from the accumulator into every part of their body. The increased absorption of the same bio-energy that is in the body helps the body to expand, thereby reducing the contractive state and promoting natural pulsation. In studies using laboratory mice, Reich (and other researchers since) found that the orgone accumulator had a remarkable affect on wounds and burns. In addition, because of the stimulation of the expansive parasympathetic response, the symptoms of "shock" could be affected. Reich believed that the main contribution of his discovery of the orgone energy accumulator was aiding in the prevention of severe biopathic disturbances.The increased orgone energy recharges the red blood cells and tissues which may reverse the cellular degeneration from a T-bacilli reaction to the healthier bion reaction, thereby improving the entire body's resistance. However, depending upon the severity of the biopathy, this is not necessarily an easy thing to do. The liver and kidneys can have difficulty eliminating the products of degenerative tissues and cells. Detoxifying programs can be especially helpful in relieving this problem. Today, we have many environmentally provoked cancers where the chronic damaging of tissues can create a localized T-bacilli reaction which can eventually develop into a tumor. Reich noted even in these situations, that the spreading of a tumor was always preceded by the accelerated degeneration of tissue into bions and especially T-bacilli: cancer never spread into healthy tissue. 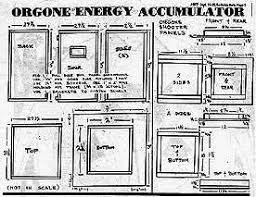 Who Can Use an Orgone Accumulator? Orgone energy accumulators can be used by almost everyone. However, Reich noted that people with certain blocked, high energy conditions should either be very cautious or not use an orgone accumulator. An initial increase in heart beat rate often occurs when using an orgone accumulating device. Even though this increased rate usually subsides, often to a lower rate than before use, nevertheless, it can cause harmful stress to already damaged hearts. People with the following heart ailments should not use an orgone accumulator, or only under very close supervision: de-compensated heart disease, high blood pressure, arteriosclerosis or heavy obesity. Preliminary experience indicates that caution be used with people suffering from ALS or MS. Conditions that can worsen with orgone accumulator use are skin inflammations, rashes, and conjunctivitis. Within the last twenty years, two double-blind experiments using orgone accumulators were performed at medical universities in Germany and Austria. The results confirmed some of Reich's findings: the subjects using the orgone accumulator recorded both higher core body temperatures and also, initially, a faster heart beat rate. In addition, most reported feeling a sense of well-being and various effects associated with a stimulation of the parasympathetic system. 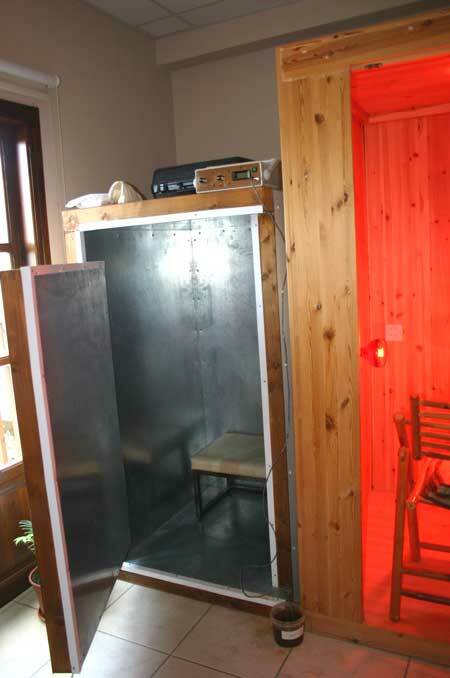 After using an orgone accumulator for some minutes, a warmth, relaxation and sometimes a prickliness may be felt. The skin may flush and sweat develop. There is a feeling of a "soft glow", and of well-being. When these sensations are no longer felt, or there is a sudden urge to do other things, the session should end. Some people who have very low energy fields may take a month or more of use before they are recharged enough to feel these effects. When using an orgone accumulator, a person wears as little clothing as is comfortable so that the energy can more easily penetrate the skin. However, being fully clothed is also just fine as the energy will penetrate the clothing, too; it will just take a little longer for the charge to build.